There's twice as much in the prize pool for this month's Betsoft slots tournament at Intertops Poker and Juicy Stakes Casino! This month, $2000 in prizes will be awarded to the top 16 players. 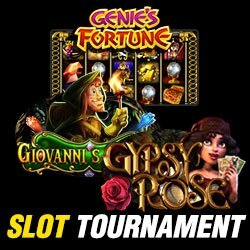 Three popular slots from Betsoft -- Giovanni’s Gems, Genie’s Fortune and Gypsy Rose -- are featured in the two-week tournament. Giovanni’s Gems is a fast-paced, vibrant 7×7 video slot. You'll explore a hidden cave in a deep forest and discover a dazzling rainbow of raw, uncut gems. Five or more matching symbols in a cluster triggers an explosive win on cascading reels. Five or more Giovanni icons wins up to 50 free spins. Amazing animation brings a Genie and his world to life in Genie's Fortune. Choose between Fame, Wealth and Love in the 3 Wishes bonus round. An animated Monkey helps win instant credits and a Free Spins Chest and special Magic Carpet feature add excitement to the main game. Gypsy Rose features Gypsy Wilds and a unique Crystal Ball symbol that can trigger four exciting bonuses, including a second screen bonus round. Intertops Poker and Juicy Stakes Casino are the busiest poker rooms on the Horizon Poker Network. In addition to Betsoft slots, they also offer slots and table games from Lucktap and Worldmatch.